On this overcast day with thunder rumbling ominously overhead, I think the weather could not be more appropriate. On this particular Friday before Easter, believers of Christ celebrate the day that Jesus was crucified. This is a mystery to most children - and sometimes adults - that we would celebrate someone's death. Death is a sad and depressing thing, one that most people associate bad things with. But as people of the Christian faith know, there is nothing to fear in death. Well, I won't say NOTHING because heck, I get worried about death sometimes. What I mean to say is that we have nothing to fear if our heart is right with God. If it is, we'll join him in a paradise far beyond what our mind can comprehend. 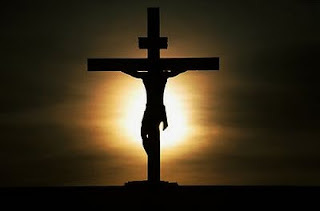 As for Good Friday, the death of Jesus was a very sad thing - for someone to endure so much pain and agony is never good...but we know that good came of it. (Hence the name Good Friday!) Jesus was crucified on a cross so we could have eternal life. Romans 5:8 says, “But God demonstrates his own love for us in this: While we were still sinners, Christ died for us.” God allowed his son to die for all of us, so we could be saved. Take a moment today to thank the Lord for everything he's done for you - your health, your family and especially your salvation. If you're not a Christian, I encourage you to read more about becoming one. Blessings to you sweet sister in the Lord. Happy Easter as well. Hope you'll pop by and visit too. Hope that you had a Blessed and Happy Easter too!